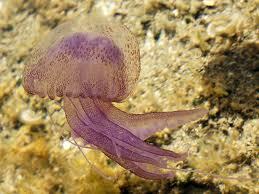 ← Captain Stingbad’s crewman grows jellyfish..
Ahoy me hardies!!!!! This here be the nasty stingin’ animal found in the Mediterranean… In Greek Pelagia means “of the sea”, nocti stands for night and luca means light thus Pelagia noctiluca can be described as a marine organism with the ability to glow in the dark. They be somethin to see for sure mates…and the sting is painful….mates use vinegar based StingMate for the best first aid…Argh!!! Aside | This entry was posted in 5% acetic acid/Vinegar on jelly stings, Box jellyfish, Chad Widmer, jellyfish, jellyfish sting first aid, jellyfish stings, Jellyfish stings, vinegar, acetic acid, Lion's mane jellyfish, Man of War, marine sting first aids, marine stings, Pacifici coast sea nettles, Pelagia Nortiluca, sea nettles, Uncategorized, Vinegar on Jellyfish stings. Bookmark the permalink.